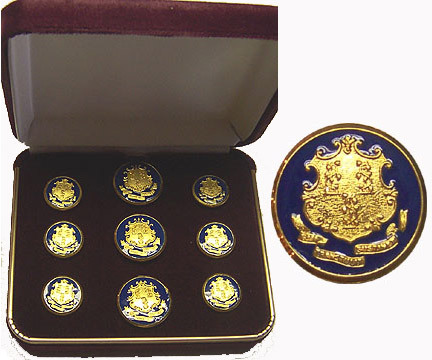 To The Best of our knowledge, Waterbury Button Company is the only organization in the world with the license, the authority, and the reason to produce products utilizing each of the 50 state seals. In stock, we maintain a small selection of their presentation state seal button sets. We will add more as they become available. Sets come in a felt lined presentation case as shown and are only offered as supplies allow. PleaseContact Uswith any questions you may have.